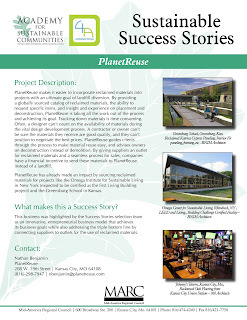 PlanetReuse proposal recognized at '09 Sustainable Success Stories event. PlanetReuse was recognized at the 2009 Sustainable Success Stories event organized by the Mid-America Regional Council at the Kauffman Center on November 23, 2009. All 24 proposals were in response to the 2009 Sustainable Success Stories Call for Exemplary Policies, Programs, Practices or Projects. The Success Stories all proposed economic, community and ecologic benefits such as, "innovative design and/or approaches, unique funding sources and/or partnerships, applicability to the Kansas City region." To view PlanetReuse's MARC Success Story in its entirety, go here and click on PlanetReuse in the "2009 Honoree" list.